Brandlin: So, THAT was Salute 2010! So, THAT was Salute 2010! That was the first thing that popped into my head this morning. Quickly followed by "but not as much as my feet!" I guess 8 hours on your feet will do that to someone of a usually more desk-bound lifestyle.Although maybe the 04:30 start and 23:00 return home, 500 mile round trip and the day long diet of Pringles may have something to do with it? The last organised gaming conference event that I went to was Gamesday 1986 (although it may have been 87?). I was musing on what has changed and what hasn't... more plastic figures and greater imagination in the games and terrain and way more people with cameras, but i was pleased to see the genuine proliferation of small companies pitching their wares - I always loved that ambitious, zealous yet amateur approach, you feel as though you're discovering their own little world when you talk to them about what they do! I spent a little time wandering around and taking pictures but I shall leave others who more thoroughly perused the games and stands to post reviews of the show. I did however get to meet some (but not enough) of the followers of this blog, and others I have known on-line for some time - notably Sally (but not Kev) from my favourite company Hasslefree miniatures. I'd like to pass on an enormous thanks to Mike Thorp, creator of Twilight for the space on his stand and the warm and helpful welcome he and his small army of helpers gave me on the day. It was great to feel so welcome by people I'd never met before or at best exchanged emails with! I wont try and give everyone a name check as I am sure I shall forget and therefore insult someone! I took along the laser-cut Pryn-Gul tower which I am sure you are all fed up seeing pictures of recently, and spent most of the day with it on the Twilight stand. Time there was separated more or less equally giving out Pringles, demanding that gamers gave their money to the twilight guys, explaining laser cutting, and eating Pringles (note to self the BBQ flavour ones are pants!). So, if you came over to see the twilight stand and said hello, and especially to those of you that mentioned you'd seen the blog and the pictures, and those of you misguided enough to say i was a genius (yes, there was more than one)... THANK YOU. I apologise in advance for not remembering who you are - it was a blur of happy faces! Almost every one who showed any sign of slowing down past the twilight stand had a tube of Pringles pushed at them, or was offered the unpainted Pryn-Gul Tower to fondle. I think I was one of the few people at the show that was encouraging people to touch the product, as several people refused in case they broke it - so much so that i took to banging the model against the table edge or dropping it on the floor to demonstrate it isn't that delicate! Once "encouraged" to stop and chat everyone had something constructive to say. It does seem as though the idea of something you build yourself, doesn't cost as much as resin, allows you to configure it modularly and means you don't spend days cutting shingles is a hit! The idea of buying building kits not covered in skulls (I refuse to finish that word with a z) or twin headed eagles was also appreciated. I could have sold a couple of dozen kits on the day if I'd had the time and conviction to get them made in time. A few common threads of discussion were. Are you going to do sci-fi? Do you do other scales? 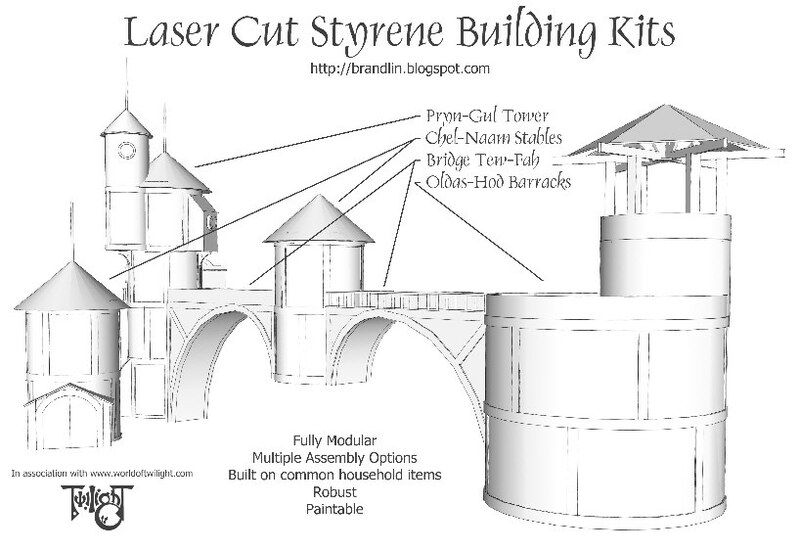 Can I just buy a sheet of lasercut shingles? Can I just buy a sheet of Windows? How about High Elf buildings with lots of lattice work? As I tried to explain to everyone on the day the answer to all of these questions is "Yes, very probably, eventually, maybe." and not necessarily in that order. There were only two questions I gave a flat "no" repsponse to. The first was the guy who asked "can you do me a large Aquilla Eagle to put on the front of my 40k Imperial Guard Fortress?" To be fair it was less a "no" and more a "NOOOOOOOOOOOOOoooooo!" for far to many reasons involving originality style and the desire not to get sued to mention here. The second was the guy that asked me if I could send him the CAD drawings of the kit so that he could print them out and make the model from cardboard for nothing. I managed a straight "no" there... Wasn't I behaving well? This is very much a hobby venture for me, and something I am learning about and growing as I go, so you may have to be patient. 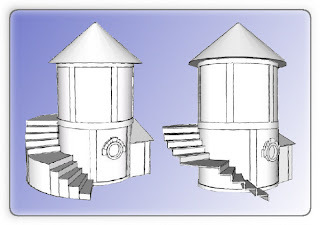 I got into building kits and was inspired by the World of Twilight game and imagery, so that's what I started with, and why all the starting models are cylindrical! 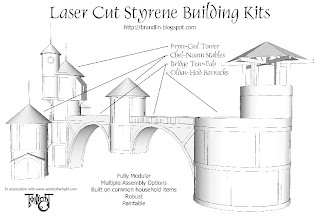 I hope to make a small range of interchangeable models and kit bits which allow you to build table top terrain to support that game or other fantasy settings. Along the way I suspect I'll do some other stuff too, so if you have suggestions or requests then leave comments. You never know what might spark my interest! You might have to be patient though. 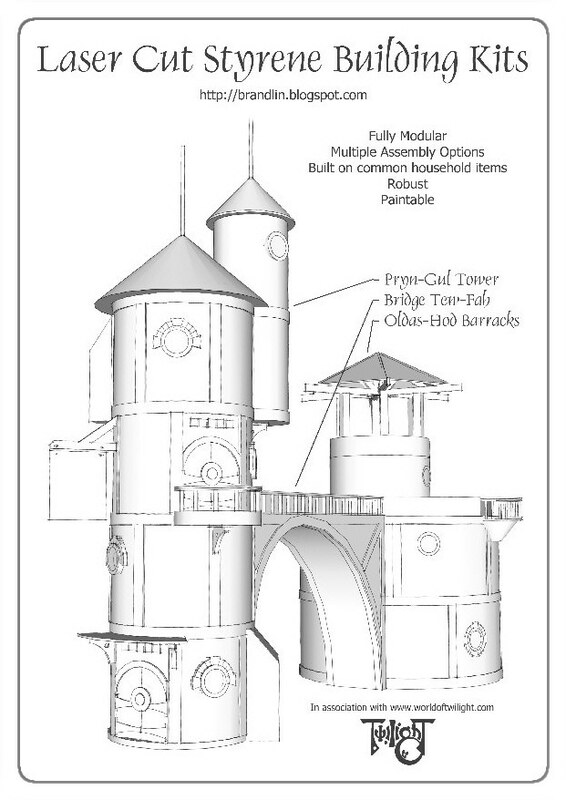 I have decided that I will be getting the Pryn-Gul tower into production fairly quickly, and I will also be making "building bits" sheets of components to help scratch your own buildings! I've put a couple of concept pictures that we had up as posters at Salute just cos I've waffled on more than I expected in this post, and it needs some pictures to break up my rambling text! But the following picture is very early work in progress I've not shown before. 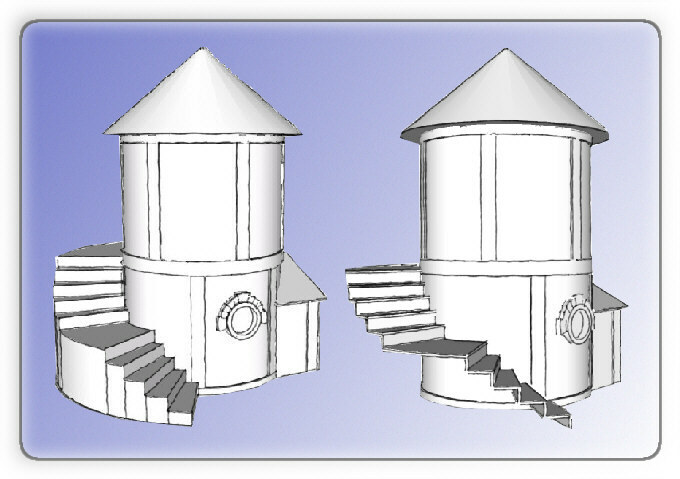 It's an external spiral staircase designed to fit to the Pryn-Gul Tower (Made from a mini pringles tube). I'm uncertain whether to make this closed or open... suggestions? Anyway, thanks to all of you that came and Ooooh'd and Aaaah'd over the tower and for your constructive comments and support. I hope to have production news for you soon. "banging the model against the table edge"
My feet hurt as well...but then I have a few more kilo's on my frame to lug around. I loved seeing your tower "in the flesh" having followed its development on this blog. The Twilight guys (and girls) were very friendly and the game does look excellent. I thought there were more new-small-startup companies on the scene this year, which seems counterintuitive at the tail end of a recession. Great stuff though. Thanks for taking the time to talk to me (and everyone else), and yes, you are a genius! Thank you Donogh. Not quite 'gamer proof' (is anything) but it'll certainly take game club treatment of being thrown in a cardboard box at the end of the night. Glad to see you had a great time at Salute. One of these years I must visit it, if I manage to get some spring holidays on that dates. 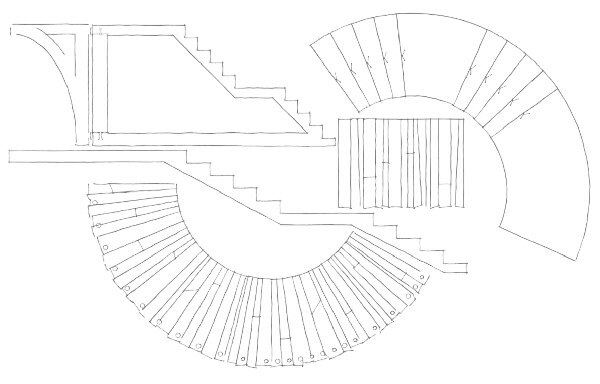 Regarding the outer stairs, closed look much better (in my opinion), and would be more useful in real life (you can have a small cabinet for tools there). 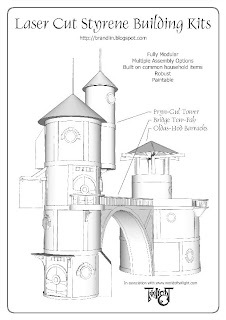 The problem is... how would you do the curved outer walls? If you find a nice and easy way to solve that, go for closed. Otherwise, open will do. thanks for the comment ajsalium. In fact the open ones are harder to model as I'd need to provide some wooden supports to run back to the tower walls and the structure would i think make them visually more interesting. 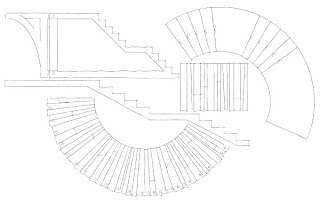 The closed in version would be closed with styrene bent to fit the stringers on the stairs. Easy enough. I like both, so may do both in time.